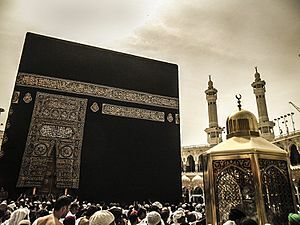 The Kaaba ("The Cube"), also referred as the Holy Ka'bah), is a building at the center of Islam's most important mosque, Al-Masjid Al-Ḥarām, The Sacred Mosque), in the Hejazi city of Makkah, Saudi Arabia. It is the most sacred site in Islam. It is considered by Muslims to be the Bayṫ Allāh ("House of God"), and has a similar role to the Tabernacle and Holy of Holies in Judaism. Its location determines the qiblah (direction of prayer). Wherever they are in the world, Muslims are expected to face the Kaaba when performing Salah (Islamic prayer). One of the Five Pillars of Islam requires every Muslim who is able to do so to perform the Hajj (Greater Pilgrimage) at least once in their lifetime. Multiple parts of the hajj require pilgrims to make Tawaf, (Circumambulation) seven times around the Kaaba in a counter-clockwise direction. Tawaf is also performed by pilgrims during the ‘Umrah, (Lesser Pilgrimage). However, the most significant time is during the hajj, when millions of pilgrims gather to circle the building within a 5-day period. In 2017, the number of pilgrims coming from outside the Kingdom of Saudi Arabia to perform hajj was officially reported as 1,752,014 and 600,108 Saudi Arabian residents bringing the total number of pilgrims to 2,352,122. Prior to the spread of Islam throughout the Arabian Peninsula, the Kaaba was a holy site for the various Bedouin tribes of the area. Once every lunar year, the Bedouin tribes would make a pilgrimage to Mecca. 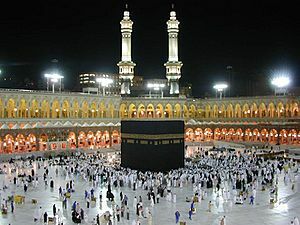 Setting aside any tribal feuds, they would worship their pagan gods in the Kaaba and trade with each other in the city. There were paintings of idols decorating the walls. 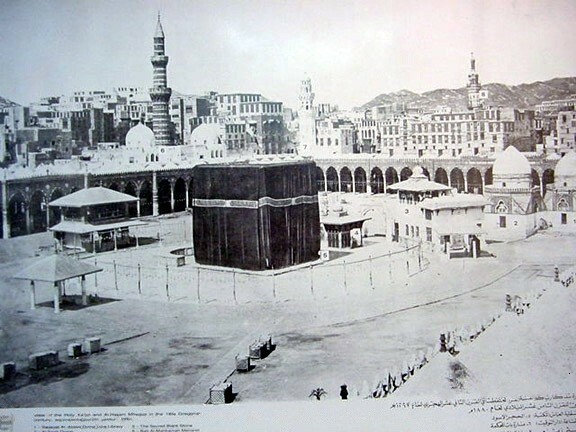 A picture of the Prophet 'Isa and his mother, Maryam was situated inside the Kaaba and later found by the Prophet Muhammad after his conquest of Mecca. 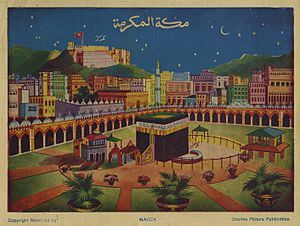 Throughout Muhammad's time (570–632 CE), the Kaaba was considered a holy and sacred site by the local Arabs. Muhammad took part in the reconstruction of the Kaaba after its structure was damaged due to floods around 600 CE. At the culmination of his mission, in 629 CE, Muhammad conquered Mecca without violence from the Muslim army. After the conquest Muhammad restated the sanctity and holiness of Mecca, including its Great Mosque, in Islam. He performed a lesser Pilgrimage (Umrah) in 629 CE, followed by the Greater Pilgrimage (Hajj) in 632 CE called the Farewell Pilgrimage since Muhammad prophesied his impending death on this event. The Kaaba has been repaired and reconstructed many times since Muhammad's day. The structure was severely damaged by fire on 3 Rabi I (Sunday, 31 October 683 CE), during the first siege of Mecca in the war. Ibn al-Zubayr rebuilt it to include the hatīm. 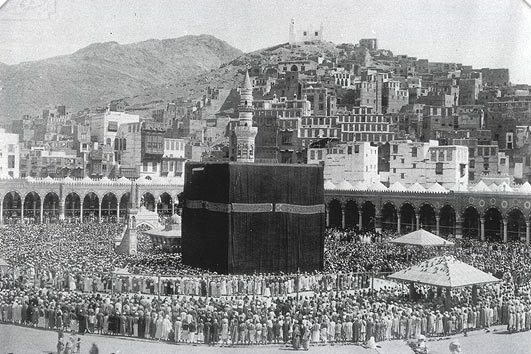 He did so on the basis of a tradition (found in several hadith collections) that the hatīm was a remnant of the foundations of the Abrahamic Kaaba, and that Muhammad himself had wished to rebuild so as to include it. 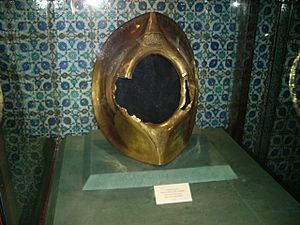 During the Hajj of 930 CE, the Qarmatians attacked Mecca, defiled the Zamzam Well with the bodies of pilgrims and stole the Black Stone, taking it to the oasis region of Eastern Arabia known as al-Aḥsāʾ, where it remained until the Abbasids ransomed it in 952 CE. 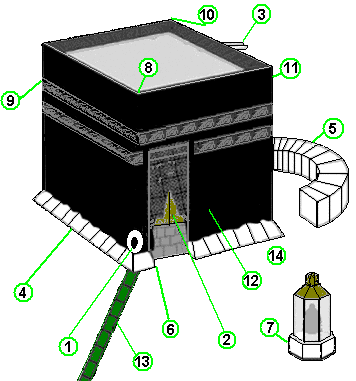 The Kaaba is a cuboid stone structure made of granite. It is approximately 13.1 m (43 ft) high, with sides measuring 11.03 m (36.2 ft) by 12.86 m (42.2 ft). Inside the Kaaba, the floor is made of marble and limestone. The interior walls are clad with tiled, white marble halfway to the roof, with darker trimmings along the floor. The floor of the interior stands about 2.2 m (7.2 ft) above the ground area where tawaf is performed. Lamp-like objects (possible lanterns or crucible censers) hang from the ceiling. The ceiling itself is of a darker colour, similar in hue to the lower trimming. 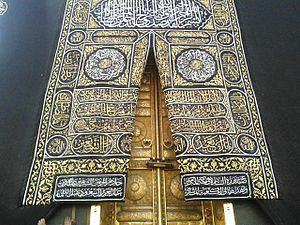 A golden door—the bāb al-tawbah (also romanized as Baabut Taubah, and meaning "Door of Repentance")—on the right wall (right of the entrance) opens to an enclosed staircase that leads to a hatch, which itself opens to the roof. Both the roof and ceiling (collectively dual-layered) are made of stainless steel-capped teak wood. The Quran contains several verses regarding the origin of the Kaaba, it states that the Kaaba was the first House of Worship, and that it was built by Ibrahim and Ishmael on Allah's instructions. The building is opened twice a year for a ceremony known as "the cleaning of the Kaaba." This ceremony takes place approximately thirty days before the start of the month of Ramadan and thirty days before the start of Hajj. 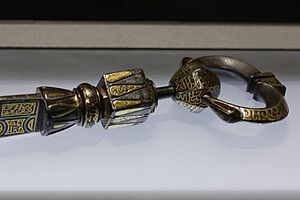 The keys to the Kaaba are held by the Banī Shaybah tribe. Members of the tribe greet visitors to the inside of the Kaaba on the occasion of the cleaning ceremony. A small number of dignitaries and foreign diplomats are invited to participate in the ceremony. 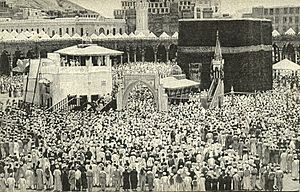 The governor of Mecca leads the guests who ritually clean the structure, using a broom. Kaaba Facts for Kids. Kiddle Encyclopedia.